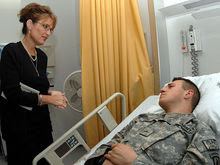 Visiting a wounded soldier in Germany in 2007 and then a campaign video. I am "stoked" about Palin. A brilliant and bold decision!